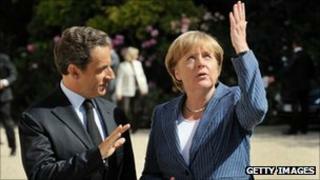 Can Merkel and Sarkozy turn the tide of markets? Image caption Could Germany become banker to the eurozone? It may be a heuristic rather than a cast-iron rule, but when markets turn against you, normally the best way to minimise losses is to cut and run as early as possible. Hanging on in the hope that something will turn up is frequently the road to ruin. So I was not surprised by the frustration and even despair I encountered when talking to bankers about last night's statements by Chancellor Merkel and President Sarkozy following their meeting yesterday with George Papandreou, the prime minister of Greece. Their joint conviction that "the future of Greece is in the eurozone", unaccompanied by any new plan to make it so, was chillingly reminiscent of those statements we in Britain repeatedly heard from the then Prime Minister John Major in 1992 that the future of the British pound sterling was in the European Exchange Rate Mechanism (ERM). And as luck would have it, tomorrow will be the 19th anniversary of the day that markets defeated politics, and the UK was forced to withdraw from the ERM - when the financial and economic costs of staying in the ERM became unbearably huge. Perhaps it is the memory of that trauma that has persuaded so many of the bankers, politicians and officials I speak to in this country that France and Germany are maximising the potential damage to the eurozone by refusing to acknowledge the economic necessity for Greece to write down the value of its public-sector or sovereign debt by somewhere between 40% and 60%. One manifestation of the heavy tariff for delaying what may be inevitable is it is now conventional wisdom that Greece may have to leave the eurozone - whereas only a year ago, anyone making such a suggestion was seen in much of polite European society as in need of urgent medical attention. It tells you all you need to know that the French president and the German chancellor last night felt compelled to say that they "are convinced" that Greece won't leave the single currency. But that sounded more like a bet than a pledge to make it so. And although stock markets have bounced a bit overnight and this morning, we will have to see whether Franco-German-Greco solidarity that isn't backed up by hard cash succeeds in staunching the flow of money out of Greek banks, and the total boycott of lending to the Greek state. This emptying of Greek banks' coffers has shown that both professional investors and ordinary people are not prepared to wager that the euro is forever in Greece. On current trends, the European Central Bank (ECB) will end up financing every single past and future loan made in Greece, because when cash leaves Greek banks, it has to be replaced by emergency loans from the eurozone and Greek central banks. Presumably some time before then, the ECB will say enough is enough - that were it to become the provider of finance to every nook and cranny of the Greek economy, its role of ensuring price stability would have been irreversibly corrupted. At which point, presumably, the rest of the eurozone would have to accept a Greek default and a much more significant reduction in the value of what the country has to repay than the implied 21% that has been allowed so far. Or it they are not prepared to do that, Greece would feel compelled to walk away from its debts and would tear up its membership of the euro club. We are experiencing something very similar to what happened in 2007-8, when it became increasingly hard for banks in the developed west to borrow and to lend, and that credit crunch transmuted into banking crisis, which transmuted into the worst recession since the 1930s. Back then governments were paralysed from taking adequate action till the moment of acute disaster by a failure of imagination - they didn't really know what to do - which was combined with a belief that to bail out the banks would be to reward recklessness and greed. This so-called moral hazard argument against rescuing those who have borrowed too much or lent too much is in play again right now - with Germany's reluctance to lend its ample financial resources to Greece and Italy, to keep them well away from the brink of collapse during this lending strike by commercial providers of finance. But unlike in 2007-8, everyone knows what could be done to restore confidence in the eurozone: if Germany made a clear and unambiguous statement that it was prepared to underwrite the eurozone's public finance, real stability would return to the eurozone much faster than it has evaporated, so long as the over-borrowed members of the eurozone stuck to realistic commitments to cuts deficits. That said, in describing the only real solution available, it also shows why it may be naive to expect a rapid end to the crisis - because the German people are understandably reluctant to mortgage their futures to nations, over whose expenditure and finances they have no direct control. As Martin Wolf of the FT pointed out this morning on Today, this German fear of becoming banker to the entire eurozone even infects the capacity of the European Central Bank to buy the debt of Italy and Spain in sufficient quantity to prevent their sovereign borrowing costs from ballooning to potentially lethal levels. Or to put it another way, it is hard to see how the eurozone convoy can or will do a u-turn on the road to ruin, unless and until that convoy sees that it is minutes away from driving over a cliff. PS I will put some stuff out on UBS's $2bn rogue-trader loss later today, when I have found out a bit more about it.